*Note: It's a steep uphill walk from the Metro Station to the hotel. If you have bags, you can call the hotel and they will send a driver for you. The cost is $10. *Note: It's a steep uphill walk from the Metro Station to the hotel. 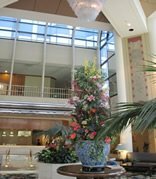 Recently refurbished, the Sheraton is one of our two recommended hotels near Universal Studios Hollywood. Just up the hill from the Red Line Metro Station, the Sheraton is an ideal home base for exploring L.A. via Metro rail.